I’ve become increasingly obsessed with exploring the area where I live, at all times of day, wanting to know where all the footpaths are, the burial mounds, woods and streams, so today I went out for another walk, continuing the route we started to explore yesterday. Heading up the hill towards the first section of footpath, the road gradually becomes steeper, before I turn off and walk over a cattle grid into the first of the fields. I’m always a little careful over cattle grids – I have visions of turning an ankle in one! 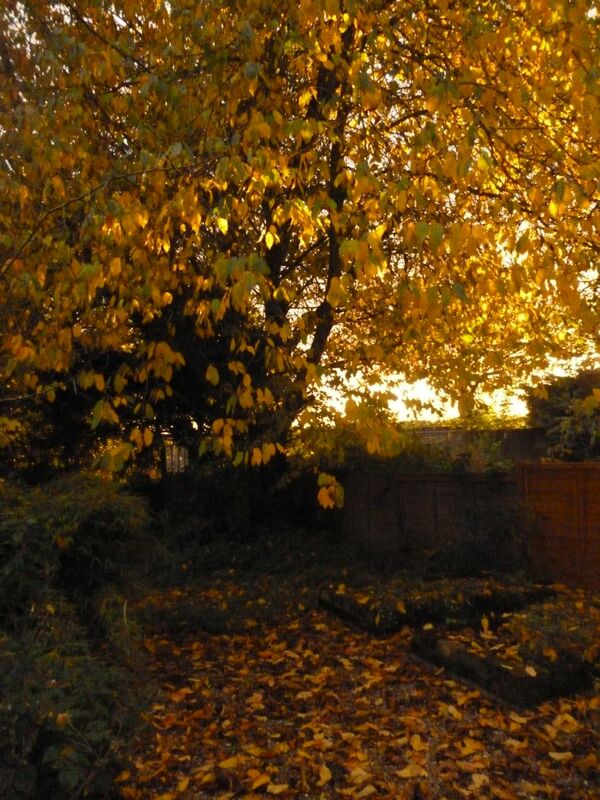 Picking my way over the field, it is becoming increasingly clear that autumn is well under way – trees are shedding leaves, and the lightning struck group of ash trees at the hill summit has a carpet of yellow and gold leaves underfoot, an amazing kaleidoscope of colour. I’ve always wondered why some folks spend so much time raking up leaves when, as soon as the next windy day comes up, the trees will laugh a load more free to create more mosaics on the ground. I tend to wait and rake leaves when the last few have shaken loose from the tree branches, and use them to tuck in my herbs for the winter. Passing through the first gate into the next field, the wind cuts across like a knife and my pace quickens as I make my way down the gentle slope and across the road. 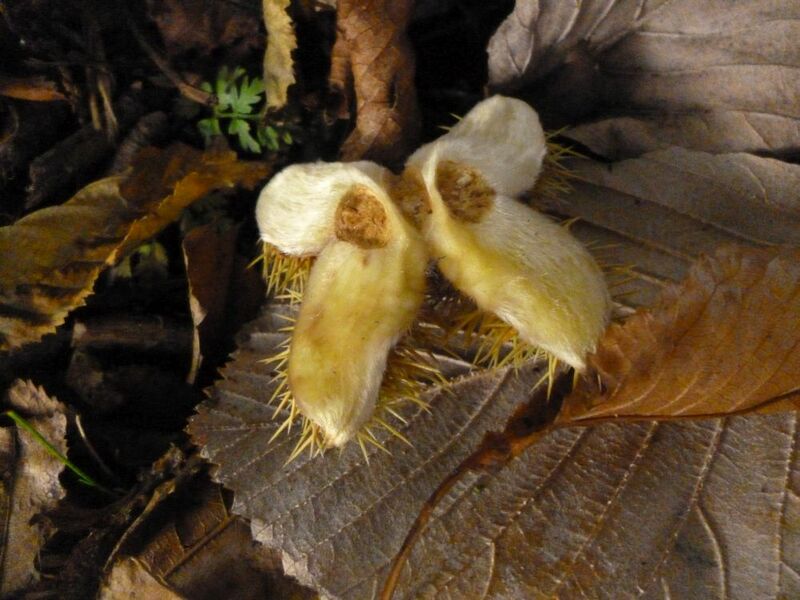 The chestnut trees where we live do not produce full sized sweet chestnuts, which is a shame, but the open nut casings are beautiful to see, splayed open in silvery crosses against the fallen leaves and mud. Head down and slogging up the opposite slope, the hedgerows are filled with fire and blood as the hawthorn berries cluster thickly. It has been a good year again for them this year, and I’ve made a mental note to go back for a load soon for ketchup. The leaves are turning rich, vivid shades of red, gold and copper, striking against the berries, though they too are beginning to fall. 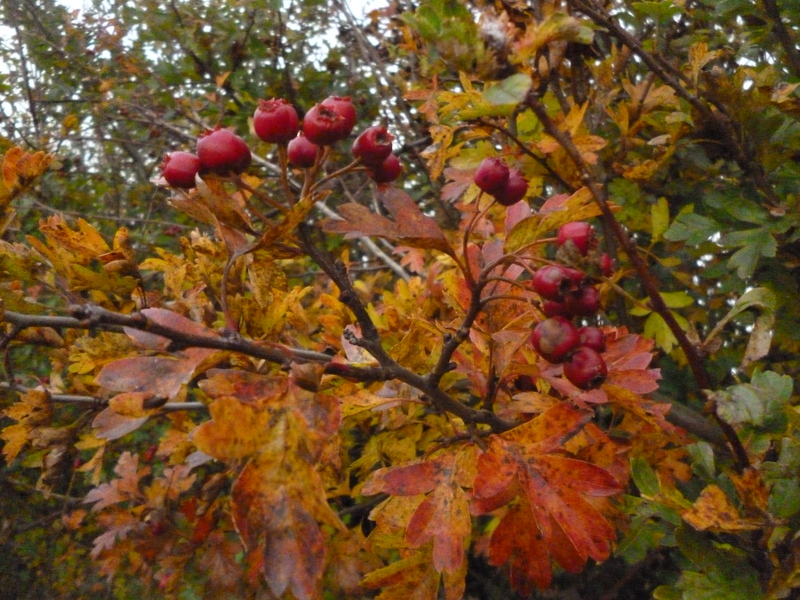 Hawthorn on jewel coloured boughs. I love the colours they go at this time of year! 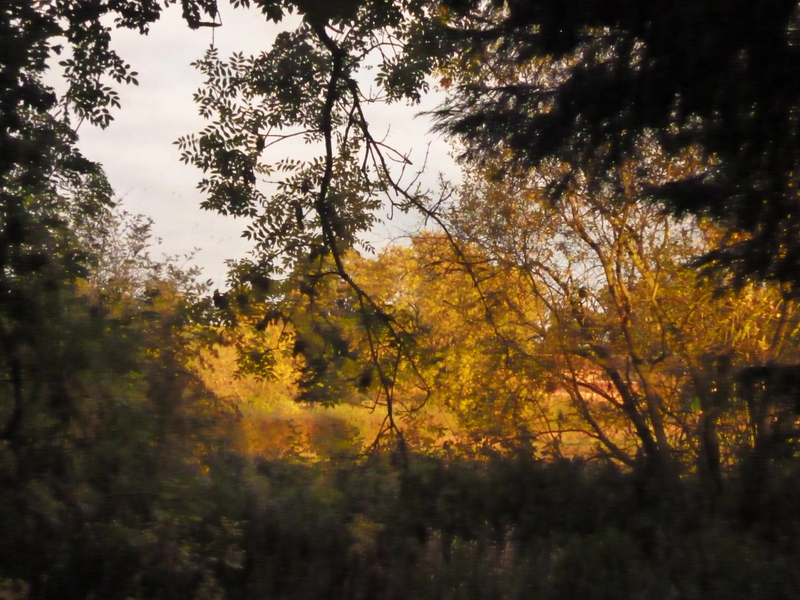 Through the stand of trees and out the other side, and a pheasant hiding under the hedge sees me and flees, shrieking an alarm as I keep walking, calling an apology. I always feel rather guilty for disturbing the poor birds. Round the corner and along another field, and down in the dip on the far side is a discovery – a dew pond surrounded by willow trees, an odd sight indeed in Lincolnshire, which is not overly well known for places like this. It is a beautiful place, the pond empty now, though given another month or so I suspect it will be full, surrounded by bare trees telling their slow stories against the skies and blackened leaf mould underfoot. A willow tree has fallen half across the dew pond, reminding me of the old story of the moon that came down to earth and was caught in a bog, and it drops a story into my head as a gift. 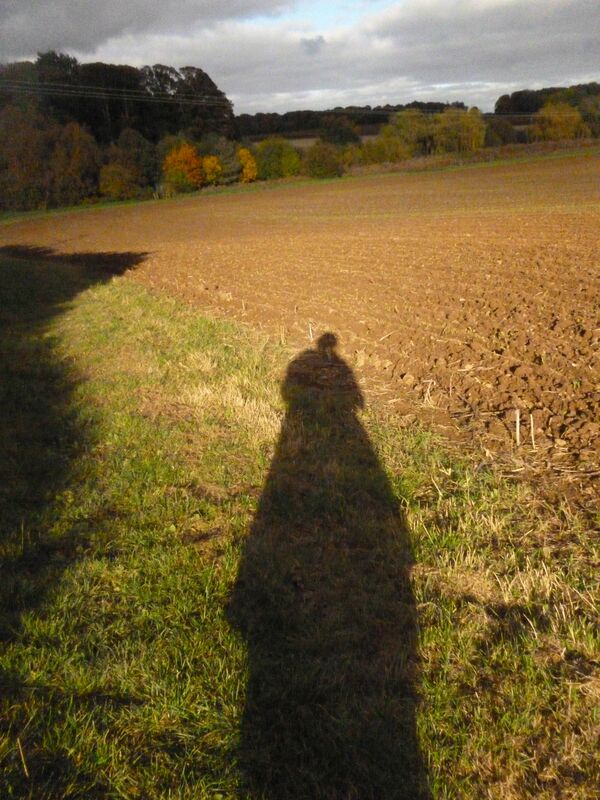 I spend the next half an hour walking and writing stories in my head, setting a good pace across the next field. Down the next slope and the sun comes behind me, turning me into a giant walking across the fields. The solitude on this walk has been blissful – this path is not well trodden and I have seen nobody so far. The end of the footpath brings a narrow country road, left and right. I choose the left hand path this time, and set off along it merrily. There are sloes every where, and further up is the most unexpected sight of steep banks beside the road, the glint of white chalk showing through like bone against the green and russet trees. White chalk through the greenery, bone like and surprising. 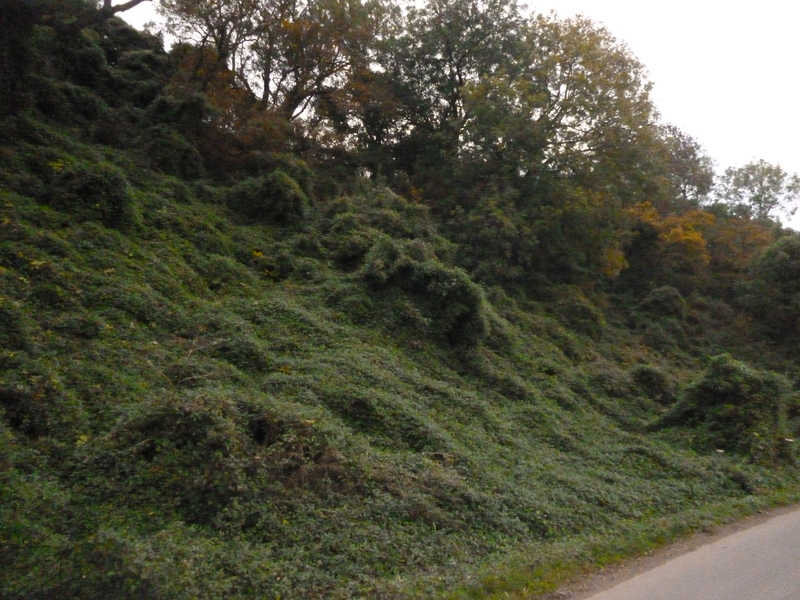 Further up the banks become steeper still, draped with trees and sweeping swathes of old man’s beard and bind weed, just beginning to produce the tufts of feathery white seeds that adorn it through the autumn. It looks like a deep green gown draped across the body of a sleeping giantess, and perhaps there are trolls living in the chalk outcrop behind it all – the Danelaw governed Lincolnshire for rather a long time. It would not surprise me if the Vikings brought their elves and faery folk with them across the seas in their dragon headed ships. Further on, the path winds around two tight bends in the road and then dives into more tall banks, this time covered with mature trees turning autumn colours. Grass sweeps down to the road in green waves, and the sound of birds echoes through the trees as I spot more sloes and hawthorns and even more elderberry – next year I shall be foraging along here regularly, and I’ve already made a mental note to go back with my basket next week for more berries. Brambles drape elegant purple stems over the path in graceful curves, the leaves turning shades of amethyst and violet spoked with startling slashes of gold and copper, one or two last remaining berries beneath the odd leaf. Rosehips cascade in merry curtains, reaching out to grab the careless walker. I know where I am now, and walk to the end of the road to make good on my guess, then, turning around, I go back the way I have come, savouring the trees and the silence, the cows in the distance and the slowly changing light across the land as it turns to copper and honey and slides across the trees, turning leaves to flame. 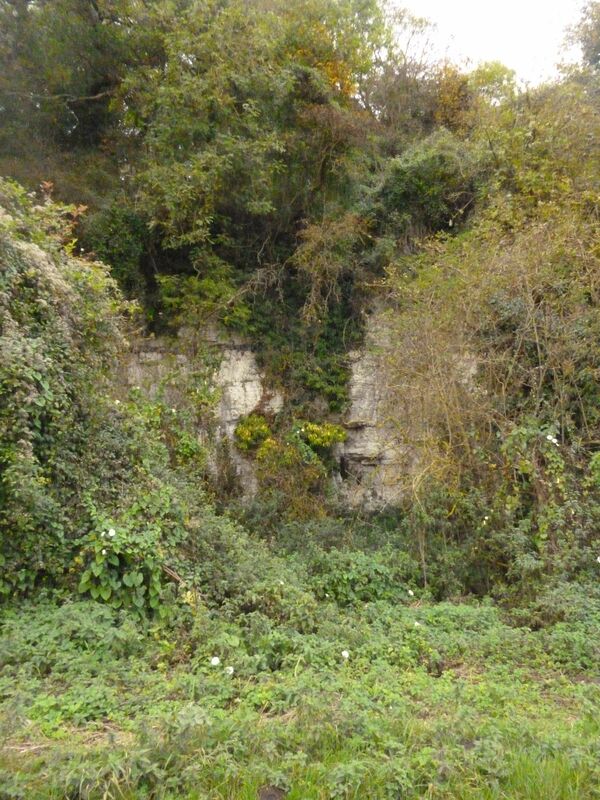 Making my way back up the footpath, my legs and feet begin to feel like the chalk of the old disused quarry, and I trudge wearily, still writing stories in my head, but also anticipating the large cup of tea waiting for me upon my return. I have begun writing again recently – stories and poems and songs, and more wake in my head daily. I shall begin the ‘Singing over the Bones’ course I signed up for, soon. The words were sleeping in me before, and I was not able to look at this land and see the stories in it, but now…. now they stretch to wakefulness and sing through my bones, demanding that I put them on paper. And so I shall continue to walk and explore this land, these hills which, on the surface of things, are so heavily farmed, but which yield such surprising delights as the glimpse of chalk through ivy, vines and trees covering steep slopes and hedgerows rich with berries and fruit. I want to know this land, to feel it in my bones and to know its footpaths and byways, its waters and wells, know its moods in all seasons. The little sisters cark and caw in the distance. alerted, breaks cover and streaks across the field. moon falls, becomes trapped beneath branches once more. rain stitching skies to the land once more. for the year to be born again. In the darkness, the Norns spin. My, but you have a way with words! If I weren’t already in love with England, I sure would be after reading this. I was just directed here by a friend we have in common, and I’m grateful for it. I too am in the Sisterhood of the Bones since last Imbolc…hope to see you there!